From time to time we sponsor trips to places of artistic, historical, cultural, scientific, adventure or career interests. These Field Excursions take place in areas near Colby, Kansas or within less than a days drive and less than 4 days duration. 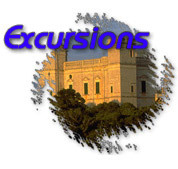 Generally, these Excursions are tied to a particular activity or student organization and not a class. However, some may be for extra credit, no credit or in some events 1 hour of academic credit may be available. Examples of such Excursions include, the Denver Art Museum to study the works of the old Masters (artistic). An excursion to a symphony or broadway touring play at the Denver Center for Performing Arts (cutural/artistic) is another favorite. A short hiking trip into the Rocky Mountain National Park to study the wildlife, flora, fauna and geological formations has proven popular. As have Excursions to such Exhibits as Body Works (biology), The Titanic (historical) and IMAX movies. Tours of the Denver Mint, Strategic Air Command, the Federal Appeals Courthouse, Kansas Supreme Court, and the Adams County Jail are other sponsored events. For Soft Adventure, Ski Trips and Indoor Skydiving are popular activities.